A four year mega-project for the diversion of the Asana river is about to start. The agreement reached in 2012 hasn't appeased concerns for the mining detrimental consequences. The Quellaveco Company envisaged the diversion of the Asana river, one of the Moqueguas largest tributaries, in order to dispose waste from its mining operations, causing contamination of aquifers and land. Resident farmers opposed the project, refused to sell their land to the company and demanded respect for their rights. The Mineria Quellaveco Environmental Impacts Assessment (EIA), approved by the Peruvian national government in 2000 triggered various civil society actors’ critics, from local groups such as Asociacion Civil Labor but also from international NGOs such as Friends of the Earth International. The area is very arid and water resources are crucial for local agriculture production. The IFC, member of the World Bank and partially financing the project of Anglo American company, finally paused the project in late 2002 . All the different stakeholders, from civil society, corporate sector and governmental, settled a round table of dialogue between 2011 and 2012. They acknowledge the necessary revision of the EIA. During the first half of 2013, the United Nations Office for Project Services, along with the United Nations Environmental Programme, led a process of revision of the hydrological assessment of the open-pit copper mine project . By the end of 2012, the round table of dialogue of Moquegua reached 26 agreements with Anglo American. During the year 2014, Anglo American kept announcing the starting of exploitation of the mine by the beginning of 2015. 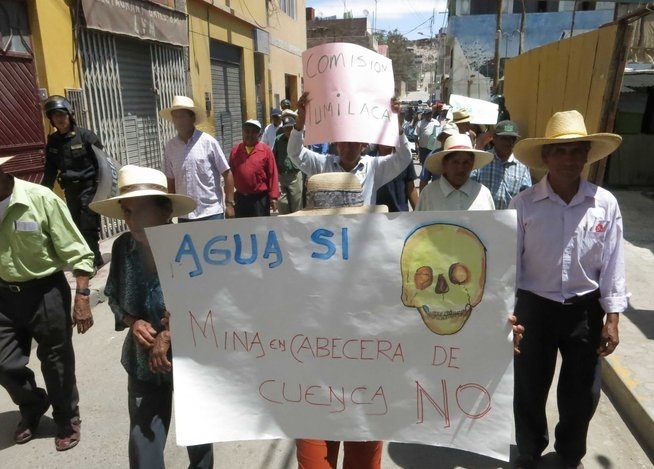 Still, by the end of 2015, the mine hasn’t taken off yet and the social opposition started to rise again due to the company’s unfulfillment of the agreements and the still ongoing threat of pollution and water shortages, particularly since the mine would be situated at a headwaters. Project Details "The Quellaveco Project is operated by Minera Quellaveco S.A.(MQSA). Majority ownership of MQSA is held by Santiago-based Mantos Blancos, 80%, with 20% held by the International Finance Corp., the arm of the World Bank that invests in private / commercial sector projects. Mantos Blancos is a holding of the South African mining company Anglo American" . Once operating, the mine would lead to the production of 225,000 tonnes per year of copper and other minerals over a lifespan of at least 32 years . Mantos Blancos - owns 80% of Minera Quellaveco S.A.
Development of Alternatives Give priority to the agriculture and food production activities as a reliable and sustainable source of livelihood for the local population. Why? Explain briefly. Despite the protests and intentions of negotiations held, the mining project continues operating without any consideration to the local population. Hacia una Estimacion de los Efectos de la Actividad Minera en los Indices de Pobreza en el Per. Torres Victor. 2005.